"I felt that, somewhere, underneath all that alternativity, was a theatrical romanticism. If it was romanticism, it found an outlet in his wonderful books, which powerfully celebrate the freedom of spirit that the conventional theatre can so easily extinguish." A personal diary featuring adventures with actors, humans and other species. The late Chris Johnston was a UK-based theatrical producer, director, actor, playwright, author, teacher, coach and general guru. He was a recognised expert on improvisation and on theatre in prisons. He was also a photographer, music fan and an inspiration to many friends and colleagues. He died in 2017 at the age of 65, leaving his wife Maggie and sons Robin and Luke. 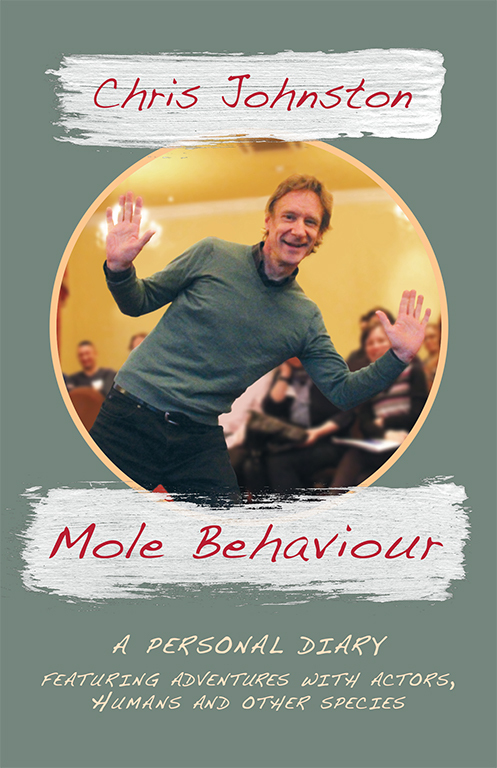 This book features diary extracts from his blog Mole Behaviour between 2010 and 2017. There are observations on theatre, prisons, travels around Europe, receiving an award from Sir Paul McCartney, a challenged hedgehog, a child's tooth and much more, including: 'Shame and Scandal in Stoke', 'Hanging up the Moustache' and 'Frank Zappa and the Benedictine Monks'. These are sharp, descriptive and witty musings on theatre and life. You can purchase this book by credit/debit card or with your PayPal account by clicking the 'Buy Now' button below. The retail price of the book is £9.50, and the costs shown on the dropdown menu below include Postage and Packing costs for shipment, depending on location.